[Image: Proposal for a converted residential water tower in Utrecht, by Zecc Architects; rendering by 3D Studio Prins, based on a photo by Stijnstijl Fotografie]. 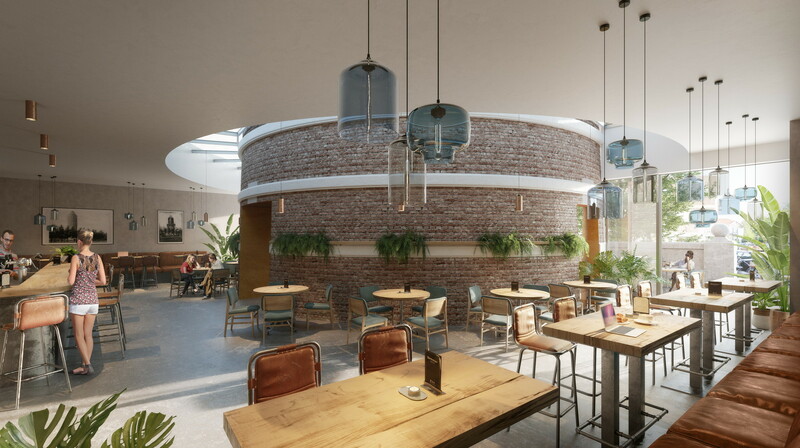 While we’re looking at work by Zecc Architects, it’s worth checking out their proposed renovation of a water tower in Utrecht. 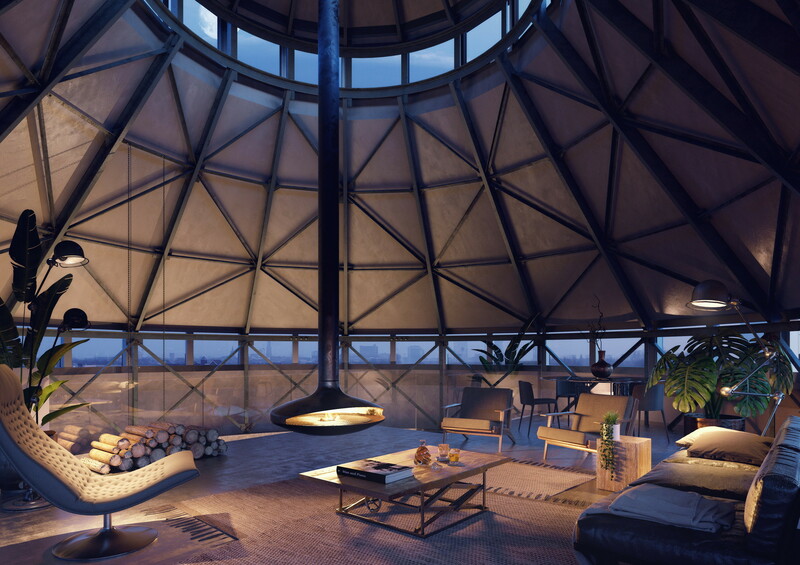 A circular room with panoramic views of the city, and a modern fireplace in the center? Yes, please. [Image: Proposal for a converted residential water tower in Utrecht, by Zecc Architects; rendering by 3D Studio Prins]. I even love where the tower’s original brick core is revealed, despite appearing in something as mundane as a restaurant. As a very brief aside, meanwhile, one of many things that remains amazing to me about the architectural world today is that these sorts of buildings—grandiose brick megastructures, from water towers to old tobacco warehouses to classic New York brownstones—are immensely popular as domestic renovations or large-scale residential conversions, but they otherwise seem to be completely beyond the pale for architects to consider designing from scratch in the present day. Even when contemporary architects do take on such commissions, they seem to leave their creativity at the door. As a former New Yorker, it always blew me away that incredible building stock existed in neighborhoods such as DUMBO—that is, huge warehouses featuring recessed arched windows, ornamented brick, and, at times, gorgeous exterior buttressing—or that even the most random online image search for historical warehouse districts pop up such incredible and evocative buildings. Yet there seems to be no appetite, either amongst developers or architects, to explore what architects could do with these same styles and languages today. Even just imagining a 21st-century brick super-warehouse (or circular tower) built from scratch in New York City—or Boston, or Bermondsey, or Hamburg—featuring modern interiors and finishes, and designed to avoid the headaches of older building stock, makes my head swoon, and there is no doubt in my mind that elaborate, architecturally complex brick megastructures could be realized today without falling into kitsch or postmodern quotation. And there is also, in fact, no inherent reason why creating brickwork residential super-projects should lead to an emerging financial ecosystem for absent investors in the process. But, hey: I’m not a real estate developer and I have no way to change the game.